This paper examines the pedagogy associated with MOOCs. It explores how the historical development of MOOCs led to two main schools of thought regarding pedagogy, and examines the European context. The influence of learning design and open pedagogy is also considered. In examining the pedagogic approaches taken by MOOCs, it is necessary to first consider their history, as two different strands emerged, which are still evident in MOOCs. The development of open courses initially grew out of the broader open education movement. There was a coalescence of interest around running open courses from a number of people associated with open education. David Wiley ran a campus based course in 2007, and made it open to anyone online to participate, as did Alec Couros, operating an ‘open boundary’ course. However, the title of founding MOOC is often given to Connectivism and Connective Knowledge (CCK08) run by George Siemens and Stephen Downes in 2008. It was commentary on this course that gave rise to the term MOOC, jointly attributed to Dave Cormier and Bryan Alexander. These early MOOCs were characterised by an interest in exploring the pedagogic possibilities that being open and networked offered. The subject matter of these early courses was related to the mode of presentation, so courses were in topics such as open education, digital identity or networked pedagogy. As with early e-learning courses which would often be about the subject of e-learning itself, these early stages of experimentation focused on subjects where the medium was the message. But as with e-learning, this soon broadened out to encompass all topics. Another characteristic of these early MOOCs was that they were experimental in terms of technology, both by necessity and design. These MOOCs used a combination of open technologies, such as WordPress and Twitter, some institutional hosting through tools such as Moodle, and even some self-created tools such as Stephen Downes’s gRSShopper. Learning to use these tools, and to make connections across the open internet was seen as a key aim for these early MOOCs. Then in 2011, MOOCs took a very different turn when Sebastian Thrun launched the Stanford Artificial Intelligence course, with over 120,000 enrolled learners. This attracted much media attention and other universities followed suit. Harvard and MIT created EdX, Coursera was launched by Daphne Koller and Andrew Ng with venture capital funding and Thrun founded Udacity. The year 2012 was deemed ‘Year of the MOOC’ by the New York Times (Pappano 2012) as most major US universities signed up to one or other of the main providers, or launched their own courses. If we take Coursera as an example, as it is the most prominent of the MOOC providers then it has over 500 courses, from 107 universities and over 5 million learners enrolled (Protalinski 2013). Pedagogically these new MOOCs were very different from the early ones pioneered by the open education movement. They tended to be institutional, based on a proprietary platform and driven by a strongly instructivist pedagogy. Whereas the initial MOOCs had emphasised the importance of networking, many new MOOCs were focused on video instruction and automatic assessment. 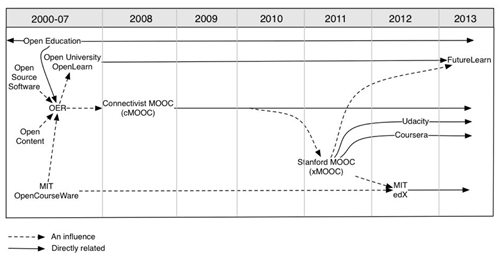 The distinction was made between cMOOCs for the early, connectivist type MOOCs and xMOOCs for the new, didactic models (Siemens 2012). To this dichotomy a range of variations has been added, including SPOCs (Short, Private Online Courses), VOOCs (Vocational Open Online Courses), SOOCs (Selectively Open Online Courses), mini-MOOCs, mobile MOOCs, etc. What this flurry of acronyms demonstrates is that MOOCs inspired a resurgence in interest in elearning generally, even if some of these variations seem to get quite far from the original characteristics of MOOCs being open. This distinction is overly simplistic as there are often collaborative elements in xMOOCs, and also cMOOCs can be quite structured. It is perhaps best viewed as a continuum; very structured, linear at one end and loosely structured, networked at the other. While different pedagogies may be suitable for different topics, or groups of learners, it is often argued that one is ‘better’ than another. This will depend on the goals of the MOOC. Jordan (2014) conducted a study of MOOC completion rates. The most significant factor influencing dropout rates was course length (with shorter courses have higher completion rates). The MOOC platform and the MOOC type (cMOOC vs xMOOC) did not have an impact on completion rate (although the data was limited to only thirteen MOOCs this comparison). To appreciate the European response to MOOCs, they need to be placed in the wider context of open education initiatives. Open education has a rich history in Europe, with the founding of the Open University in 1969 and similar universities in Netherlands, Spain and Germany. Open Universities represent one interpretation of ‘openness’ in education, namely open to places, people and methods – so it developed an open entry, part-time, distance education model. Open education was thus a recognised and respected discipline in Europe, more so than in the US, and so MOOCs were seen as part of this existing context. Another influence on open education was open source software, which gave rise to open licenses and the concept of publicly shared goods over the Internet, and then Open Educational Resources (OER). The UK in particular had considerable OER investment through national frameworks funded by JISC (the Joint Information Systems Committee) and the Higher Education Academy (HEA) OER programme, which promoted many small scale OER projects from 2009 to 2012 (https://jisc.ac.uk/guides/open-educational-resources). JISC also established JORUM, a national OER repository. Although this was closed in 2015, and the OER programme has now finished, it was significant in raising the profile of openly licensed, and free resources. In addition the Open University launched the OpenLearn repository in 2006, which has released over 10,000 hours or material and has over 4 million visitors per year. MOOCs thus entered into a higher education context that was well acquainted with concepts of openness. These influences are highlighted in Figure 1, from Yuan and Powell. This context may account for why Europe was relatively slow in adopting MOOCs, as they were not seen as revolutionary as they were deemed in the North American context. There was some collaboration with early MOOC pioneers such as George Siemens and Stephen Downes, but it was not until the year 2012 that universities started launching MOOCs. The Hasso Plattner Institute delivered MOOCs on its own platform, focusing on engineering topics (https://hpi.de/). UNED similarly offered a range of MOOCs in 2012 on its own platform. Edinburgh was the first UK university to partner with major MOOC providers Coursera and EdX. These were largely xMOOC in type, and the university entered into their provision in an experimental manner, to investigate the MOOC phenomenon, rather than with an explicit goal such as recruiting students. They stated “Our Edinburgh MOOCs offered us a route to experimentation with online delivery methods at large scale, and gave us a chance to learn lessons that might be applied elsewhere in our educational portfolio” (MOOCs@Edinburgh Group 2013). Spain was the most active European country in MOOCs, with the UK, Germany, Italy, Denmark and the Netherlands all developing MOOCs from different universities, and France becoming increasingly active in 2014. There was little engagement with the major MOOC providers, the preference being for universities to develop their own platforms. There is now wide coverage of MOOCs across Europe in most languages, on a variety of platforms (http://openeducationeuropa.eu/en/open_education_scoreboard). Other experiments were conducted elsewhere, for example the OLDS MOOC (http://www.olds.ac.uk/) focused on learning design, which was funded by JISC and run by the Open University. This used a more cMOOC approach, combining different technologies and emphasising a networked, peer supported approach. The German based company iversity is one of the main European competitors to the main MOOC providers. It developed out of a learning management system, and was launched in 2013. Most iversity courses follow an xMOOC type approach, ending with a final assessment or exam which can be taken on-site, online or in an exam centre as a final project that has to marked by the instructor. Universities that offer a MOOC on iversity have the option of offering European Credit Transfer and Accumulation System (ECTS) credits. In this practice, iversity is unusual for MOOC providers in offering the potential for recognised university accreditation. In 2012 Open University Vice Chancellor Martin Bean announced the formation of FutureLearn. This was a company developing a MOOC platform, partnering with UK universities. It was a response to the US-centric focus of MOOCs thus far. With 29 UK universities and more overseas, FutureLearn is the biggest UK MOOC provider, and aims to tread something of a middle-­ground between the very distributed, unstructured model of cMOOCs and the very centralised xMOOCs. There has been a focus on using the scale of MOOCs to facilitate elements of social input. The platform claims to be based on the work of Hattie (2009) on visible learning. This was based on a meta study of effective strategies in education, and recommends the following techniques: Student self-­reporting grades, formative evaluation, teacher clarity, reciprocal teaching, feedback, teacher-­student relationships, metacognitive strategies, self-verbalisation/ questioning, teacher professional development, and problem-­‐solving teaching. In reality the degree to which this is implemented will vary between partners and courses. 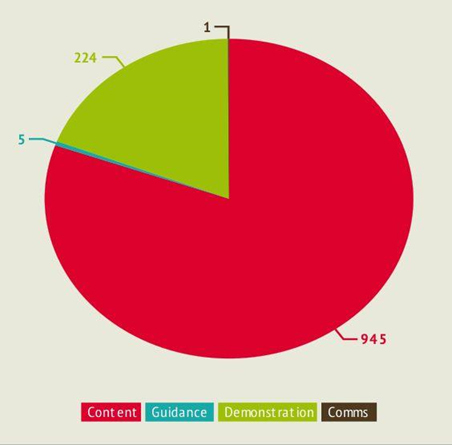 The experimental cMOOC approach has remained largely on the periphery in Europe, confined to individual experiments such as the OLDS MOOC and H817 Open (http://www.open.edu/openlearn/education/open-­education/content-section-0). The focus of these courses has been as much in the types of technology used as the underlying pedagogy. These courses place a strong emphasis on users owning their own space, and making use of the network. Thus learners are encouraged to set up their own blog space, to use twitter (or other social media tools such as Google +), hashtags to find and communicate with others, and an aggregated blog that pulls together different contributions. These courses were influenced often by early open courses such as DS106 (ds106.us) which have taken a much more student centric approach, for example, with students suggesting assignments and choosing which assignments they wish to complete. Some European universities have signed up for Coursera, and similar platforms, many universities have launched MOOCs on their own platforms. For example Uninettuno in Italy delivers a range of MOOCs in both Italian, Arabic, French and English, on their own platform (http://www.uninettunouniversity.net/en/mooc.aspx). These are largely xMOOC in format. Similarly, UNED in Spain offers a number of xMOOC type courses, focused around short videos and online assessment, using their own platform (https://coma.uned.es/). In terms of pedagogy the early experimental phase of MOOCs was superseded by a focus on platforms and business models during the period of MOOC expansion. While many of the xMOOCs are high quality production, in terms of pedagogy they are often limited, based on passive video watching and taking online quizzes. However, having gone through this phase of early enthusiasm, there is some evidence that universities are now becoming interested in pedagogic experimentation again. Because MOOCs do not carry formal credit and are not paid for by learners, they are the ideal vehicle for conducting experiments. This can be in terms of A/B testing, for example testing different resources, the placing of these resources within a course, new technologies, etc. By running these across two separate presentations of the same MOOC and controlling other variables then the impact of one aspect on performance can be isolated. Another area of interest is in the use of learning design in implementing and evaluating MOOCs. In the UK JISC and CETIS funded a number of learning design projects, which, as with OERs, had the benefit of raising awareness of the approach. One large project was JISC OULDI (http://www.open.ac.uk/blogs/OULDI/) which developed a number of learning design tools. FutureLearn runs regular learning design workshops for its partners, using the Open University adaptation of these tools. 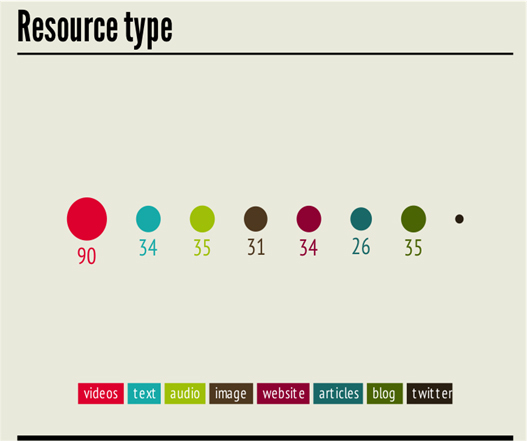 How these resources are used can also be mapped, depending on whether their function is Content (delivering teaching material), Guidance (offering support and guidance for learners), Demonstration (learners demonstrating their understanding for example through assessment or blog posting), or Communications (for example posting to a forum). The pedagogy in this course is focused on watching videos and then taking tests. It is a useful way to approach a topic for beginners and covers a good deal of content in a short course. Whereas a cMOOC such as DS106, has a broader mix with guidance, and demonstration, as learners are encouraged to experiment and create artefacts for themselves. Here the aim is more on developing skills and ways of thinking. These representations were created retrospectively, from existing MOOCs. It is possible to consider which ‘pattern’ of activity and resources a MOOC should have before developing it, given the overall aims of the course. Costs to student – many MOOC providers are selling accreditation and the overall cost required in order to amass enough credits for a degree can now be compared with formal offerings, which have benefits of support. MOOC production costs – initially many thought MOOCs would be cheap to produce but they have become increasingly expensive. Hollands & Tirthali, (2014) put the cost between $152K and $244K per MOOC. Effectiveness as recruitment tools – one of the potential benefits of MOOCs is that they can lead to formal student enrolment. There is now sufficient data to examine whether they are effective marketing tools, and can compare them against other outlets (eg advertising) in money spent per recruited student. Demographics of MOOC learners – many universities engaged with MOOCs as part of their social mission and broadening access remit. However the typical demographic of MOOC learners tends to be highly qualified, from privileged socio-­economic backgrounds (Hansen and Reich 2015). New learners – on their initial presentation a MOOC may get high numbers of enrolments but this then usually decreases for subsequent ones. In addition many learners take multiple MOOCs. So once this audience has been reached there may not many new learners are to be found. The MOOC business model will rely on large numbers across multiple presentations. None of these are factors relating to pedagogy, but they will have an impact on whether MOOCs continue to be invested in, and what role the university sees for them. If MOOCs are viewed as being a showcase for the university then they will often have high production values, but relatively instructivist pedagogy. If they are viewed as tools for experimenting, then they may be lower in production costs, but more diverse in terms of pedagogy. Be as open as possible. Go beyond open enrolments and use open pedagogies that leverage the entire web, not just the specific content in the MOOC platform. As part of your open pedagogy strategy use OER and openly license your resources using Creative Commons licenses in a way that allows reuse, revision, remix, and redistribution. Make your MOOC platform open source software. Publish the learning analytics data you collect as open data using a CC0 license. Use tried and proven modern online learning pedagogies, not campus classroom based didactic learning pedagogies which we know are ill-­‐suited to online learning. Use peer-­to­-peer pedagogies over self-study. We know this improves learning outcomes. The cost of enabling a network of peers is the same as that of networking content – essentially zero. Use social learning, including blogs, chat, discussion forums, wikis, and group assignments. Examples of open pedagogy would include Jim Groom’s DS106, an open course which encourages learners to create daily artefacts, suggest assignments, establish their own space online and be part of a community that extends beyond the course both geographically and temporally. Dave Cormier starts his educational technology course every year by asking students to create a contract stating ‘that each of you decide how much work you would like to do for what grade. Individual assignments are given a “satisfactory” or “unsatisfactory” assessment upon completion’ (Cormier 2013). Courses such as Octel (http://octel.alt.ac.uk) have learners create their own blogs, and this is used for all their solutions. The course then automatically aggregates all of these contributions into one central blog. All of this is conducted in the open. The cMOOC and xMOOC distinction in MOOCs is the main categorisation used in considering their pedagogy. This grew out of the manner in which MOOCs were developed, and reflects how MOOCs are viewed by their developers. The function of MOOCs can be to recruit students, to act as a shop window, to reach new audiences and to allow experimentation. Depending on which of these motivations is most prevalent will influence the type of pedagogy adopted. The dominance of commercial MOOC providers such as Coursera, EdX and Udacity in North America, has shaped the pedagogy they have adopted. This platform dominance is not as prevalent in Europe, with many universities developing their own platforms. The two main European MOOC providers are iversity and FutureLearn. While the xMOOC approach is still prevalent, there is a mixture of other elements within many of these courses and platforms. Developing a learning design approach and exploring the open aspects of pedagogy is likely to be a key area in terms of the pedagogic development of MOOCs. However, MOOCs have received a good deal of media attention and may now be subject to a backlash. They also have to demonstrate their value to providers and sustainability. The pedagogy of MOOCs cannot be viewed in isolation from these other factors, which will shape the nature of MOOCs over the next five years. Haggard, S., Brown, S., Mills, R., Tait, A., Warburton, S., Lawton, W., & Angulo, T. (2013). The Maturing of the MOOC: literature review of massive open online courses and other forms of online distance learning. Department for Business, Innovation and Skills, UK Government. Hansen, J.D. and Reich, J., 2015, March. Socioeconomic status and MOOC enrollment: enriching demographic information with external datasets. In Proceedings of the Fifth International Conference on Learning Analytics and Knowledge (pp. 59-­63). ACM. Hattie, John (2008). Visible Learning: A Synthesis of Over 800 Meta-Analyses Relating to Achievement. NY: Routledge. p. 392. ISBN 978-­0-415-47618-8. Pappano, L. (2012) ‘The Year of the MOOC’. New York Times, Nov 2, 2012 http://www.nytimes.com/2012/11/04/education/edlife/massive-open-online-courses-are-multiplying-at-a-rapid-pace.html? thank you for this interesting paper. It si very elaborated and well-written and I enjoyed to read about the different types of MOOCs and the c-MOOC, xMOOC etc. becuase I always love to read about the theory of certain frameworks. 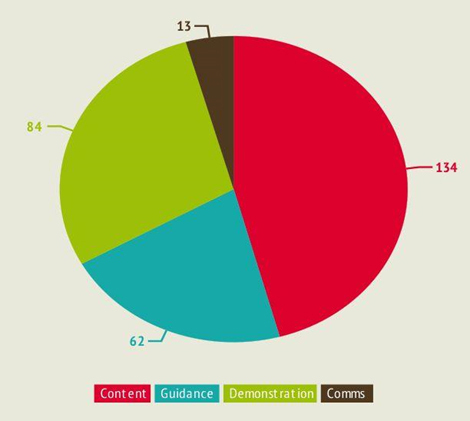 Citate from Research Gate: “What are the current trends in MOOC research? What are the main research methods applied? I like Paul Stacey’s recommendations. I believe they are rather similar to Stephen Downes’ approach of connectictivist MOOCs. Downes summarized the activities of using and reusing resources with remix, repurpose and share. I was a learner in his change11-cMOOC which was a very exciting and challenging learning experience. In developing our own MOOC I didn’t find the courage to offer a cMOOC. In cMOOCs learners need a lot of autonomy and self-responsibility – and studies show that learners who finish MOOCs are these advanced learners.